Yesterday was a day spent with a heavy heart. First, a friend of mine's grandmother was laid to rest and shortly after the funeral we learned that 1SGs bestmans mother passed away. Though both these women have lived long lives and their love will continue beyond yesterday, its always heartbreaking. We were recently cleaning up some magazines that the bestman always sends 1SG and his ma had written tiny little notes on the articles she thought we would enjoy most... brings a smile to my face. We will embark on the journey to Michigan to lay his ma to rest and be there for 1SGs bestman and lifelong best friend. 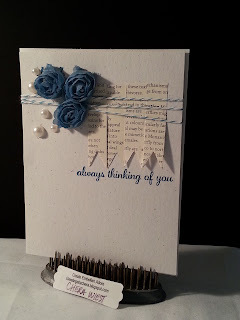 Great use of retired ribbon roses, that were dyed Indigo, and adding some pearls seems to finish this off nicely.I could have added a smidge more indigo but the Naturals white seemed more fitting.